Removing a tree stump is a difficult job. Roots are buried very deep and if not properly removed, will interfere with the planting and growth of anything new in that area. Anyone who has tried to remove a stump on their own will tell you this is not something you want to try yourself. It requires the proper equipment and training to get the job done. Stump grinding machines can be very dangerous to use on your own! Stump grinding with the use of a grinding machine produces the best results. These machines have a motor and a toothed arm that resembles an over-sized chain saw. Great care must be used with these machines; they are dangerous! Elliott Tree is OSHA 10 Certified and all of our technicians are professionally trained. 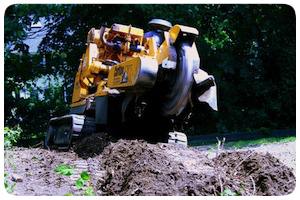 Owner, Graeme Elliott is on every job site to ensure your stump grinding project is completed safely and on schedule. Call a Stump Removal Expert!